Rosa Walton and Jenny Hollingworth remember the moment they became pop songwriters. They were in Los Angeles with highly sought-after producer SOPHIE, playing one of their meticulously constructed demos. Built on a swirling chord sequence that repeated over and over, building anticipation for the vocals, the Norwich duo believed they were creating dramatic tension. SOPHIE made a simple suggestion: just go straight to the hook. "We were like, 'Oh, no. We need the chords for the intro. People are supposed to get into it,'" Walton recalls. "And she was like, 'It would be more effective if it just came in immediately.' After a while, we let go and realized that not every song has to have a really long build up before the vocals come in. Things like that opened up our eyes to how pop songs work." And like that, Walton and Hollingworth had learned an essential lesson in pop songwriting, one that reverberates throughout their laser-focused sophomore release, I'm All Ears. Where their 2016 debut, I, Gemini, became a minor sensation with the duo's cracked fairytale storytelling and helium-soaked vocals, their follow-up blows up the goth-synth template of their debut in favor of an expansively futuristic pop palette. Now 19, Walton and Hollingworth retain their playfulness and taste for the surreal. 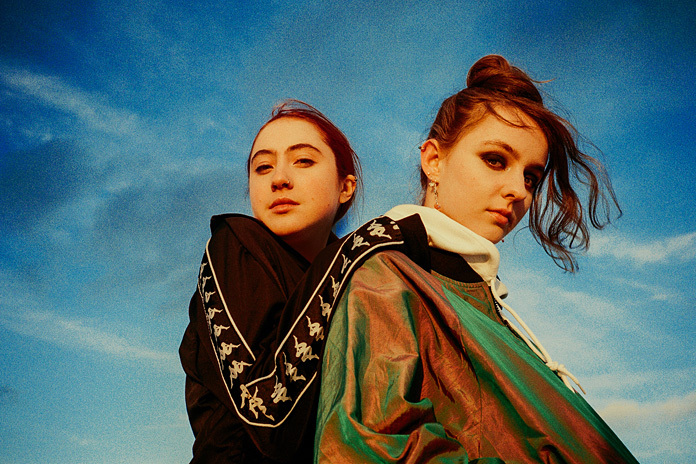 But where the first album was largely the work of two precocious 16-year-olds who took two Yamaha keyboards and a little bit of inspiration a long way, I'm All Ears is a sophisticated work of mature pop songcraft. Best friends since they were five, Walton and Hollingworth speak in fragments, often finishing each other's sentences and consulting with each other before answering questions. Ask them about particular songs, and you're likely to get two slightly different origin stories. Ask them what they think about the possibility that such an album could greatly expand their critical and commercial profile, and they quickly are in agreement that they care little about how their work is received. Push a bit harder, though, and Walton and Hollingworth will admit that "Hot Pink"—a track that subtly threads feminism and self-empowerment through glimmering misfiring electronic textures—was written as a message for their audience. But while their songwriting veers towards the topical in a few places, the duo is hesitant to refer to themselves as an overtly political act. "A lot of things have changed over the past few years," Hollingworth admits. "I don't think Rosa and I were writing songs—other than possibly 'Hot Pink"—as a statement. We're not trying to do anything than write about things that we think about. Maybe that will change. Maybe we will be more political. It feels kind of like a responsibility to get our message out, but even when we do interviews and I start talking about politics, I'm worried that I'll say something that will have a negative effect. You have to really think about it when you have a platform." To have a platform at all is something Walton and Hollingworth are still getting used to, as they are quick to point out that Norwich is not exactly known for its music scene. Unlike, say, London, Bristol, or Manchester, there is no "Norwich sound." This has, they suggest, been beneficial, allowing them to develop in relative isolation. Just what they've developed into is another question. For this moment, they are content to call themselves a pop band. "I guess pop music is about catchy hits," Walton says with a self-effacing laugh. "And we're all about catchy hits."